Honoring the Architects and Owners of projects that enhance the City of Chandler's built environment and quality of life through their exceptional design. This award acknowledges excellence in design and recognizes achievement in a high standard of architectural quality. 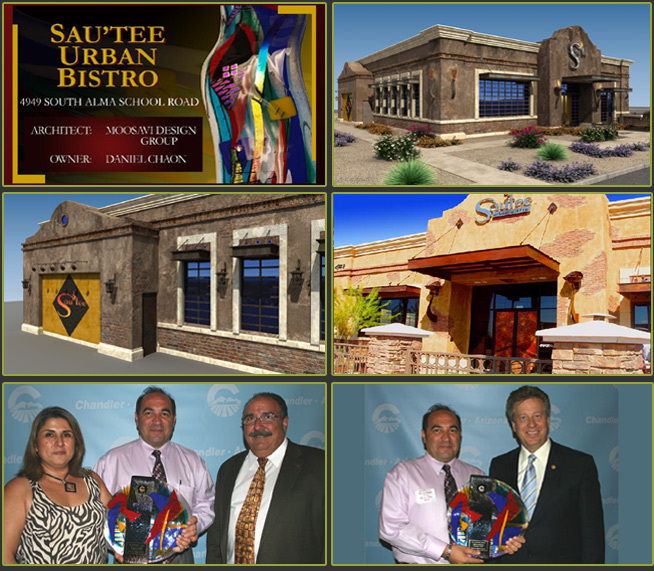 Sautée Urban Bistro is located at the Northeast corner of Chandler Heights & Alma School Road, Fulton Ranch Promenade, Chandler, Arizona. A variety of building parapet heights, including a special entry feature articulating the building facades with architectural features that are intended to address the impact size with a balanced, proportional and rhythmically harmonious architecture. The main entrance, as the focal point of mass, has been carefully designed to attract the visitors. 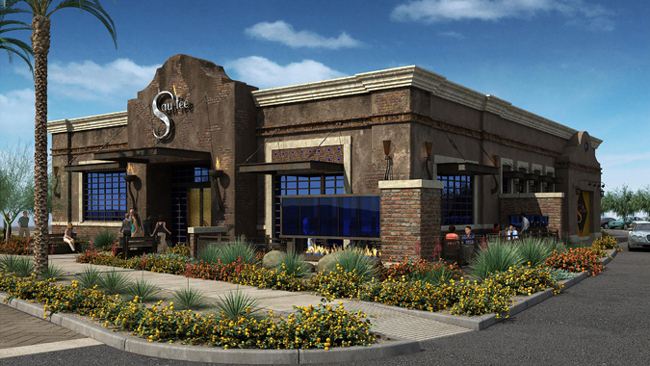 The façade is constructed with a combination of brick and specially treated stucco that strongly carries the urban dining experience both inside and outside. The materials used on the main structure are a combination of Tumble brick and smooth stucco/EIFS system which creates a historical appearance to the mass. The logo and sign on the front entry incorporates a real gas operated flame in order to symbolize the feel of the restaurant and the grill in general. 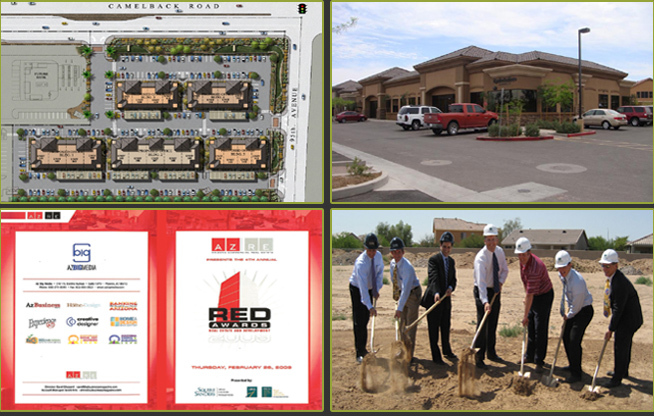 AZRE (Arizona Commercial Real Estate Magazine) has chosen to grant us an Honorable Mention Award at the 4th Annual Red Awards to our Camelback 101 Professional Medical Office project. AZRE has published a special report highlighting this project within its March/April 2009 Issue. Camelback 101 Professional Medical Offices, located at the Southeast corner of 101 Freeway and West Camelback Road, Phoenix, Arizona. The proposed new commercial center development with a gross area of 12 Acres has been divided into two parcels. 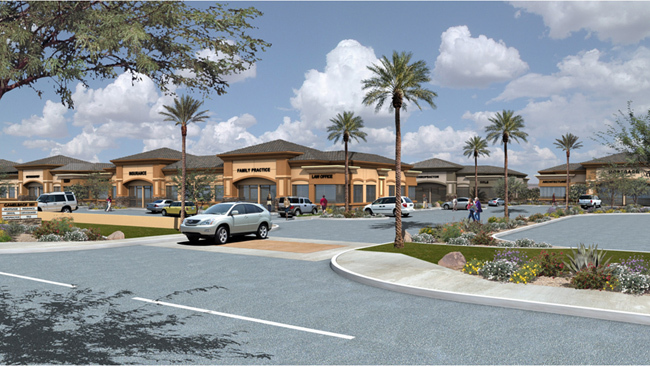 Parcel one includes a Fitness Center, retail shops, and 2 pads. Parcel 2 includes 5 office buildings. A substantial effort has been made to create an architectural site design that incorporates multiple uses so that they are consistent both internally and with respect to the surrounding area. The offices and retail building elevations are designed to establish two separate and unique identities. Exterior walls consist of multiple levels of surfaces to provide pleasing shapes and patterns that flow from one side of the building to the other. Cornices and border treatments punctuate important architectural features such as entries, roof peaks and windows. The building materials, colors and hues utilized are consistent with the desert environment to add variety and uniqueness to the site design.